The Buick LaCrosse has an all-new design for 2017 with lots of nice features and one big mystery. Maybe you can solve the riddle: Why does a Buick need 20-inch wheels? The obvious answer is because younger customers demand it. They see cars with wheels massive enough to have their own gravitational pull at auto shows, then walk into their local dealerships expecting to buy the same thing. Little do many buyers know — or care — about the challenge that creates for engineers who have to make the real-life cars drive smoothly with their mega-sized shiny disks wrapped in low-profile tires that look like tightly stretched rubber bands. On the stage, a car just has to look pretty for cameras. On the street, it has to actually be a car. The fact that my 2017 LaCrosse handled its oversized wheels so competently speaks to the skill of General Motors’ brainiacs, and it also sums up the challenge of making Buick seem young and hip. While it’s still firmly planted in America’s stodgiest category, the full-size sedan, the new LaCrosse is taking clear steps toward being a better contemporary fit. Its optional rapper wheels are just one part of that. 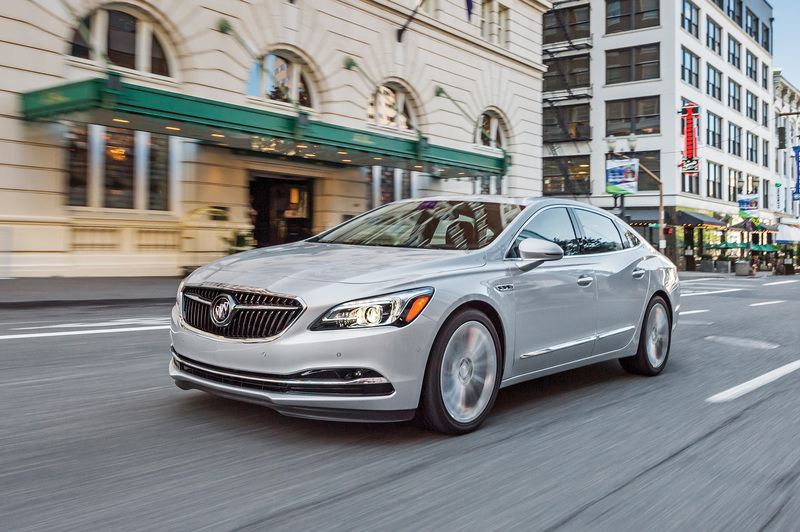 A sleek hood and aggressive character lines on the rear fenders make the 2017 Buick LaCrosse look more dynamic than before, a good match for its livelier handling. Its new structure is a whopping 300 pounds lighter than the previous generation, which is better for fuel efficiency but also more rigid thanks to the increased use of special high-strength steel. The weight reduction and stiffness help its handling, which gets crisper and sportier. It’s a good match for the new 310-horsepower, direct-injected V6 and eight-speed automatic, making this the liveliest LaCrosse ever for spirited driving. At the same time, it retains the classic Buick signature of a quiet cabin and reasonably smooth ride. Gas mileage is impressively miserly for a roomy, powerful car, with a 31-mpg highway rating on front-wheel-drive models. Even the all-wheel-drive version gets a respectable 29 mpg, according to the government tests. As for pricing, the new LaCrosse starts at $32,990, including the brilliant new engine and transmission. It’s a good option for someone who wants a smooth-riding, entry-level luxury car, but it’s missing some of the key features that would make it more competitive in today’s premium market: lane keep assist, blind zone sensors and massaging seats, to name a few. To get those things, you’ve got to step all the way up in price to the Premium trim level at $41,990. All-wheel drive will add an extra $2,200 on top of that, plus $1,690 for adaptive cruise control and the ability to park itself, plus another $1,300 if you want Jay Z’s 20-inch wheels with an adaptive suspension. The all-new LaCrosse has a well-built cabin that competes well against the Japanese and German brands that have long set the standard for luxury interiors. The end result is that you can choose between two different Buicks. On the one hand is the base LaCrosse, the Buick of yesterday, which is very competent but hardly competitive with someone shopping for an Audi, let’s say. On the other hand is a product that Audi buyers might actually consider, assuming they’re not blinded by the badge. Yes, the LaCrosse Premium is a big leap in price, but it’s still a relative bargain compared to German and Japanese brands that offer the same level of sophistication, Silicon Valley technology and performance for even more cash. It’s completely redesigned for 2017 with gorgeous new styling and a much more engaging driving feel. A tech-packed, luxurious Premium trim level lets it compete in a higher class than ever before.